What Cardinals Should Be In The Hall Of Fame? There’s been a lot of talk about this year’s voting for the Baseball Hall of Fame among the baseball media. Perhaps you’ve noticed? This year’s ballot was the first to include recent players such as Barry Bonds, Roger Clemens, Mike Piazza and Sammy Sosa, and it seemed like practically every member of the Baseball Writers’ Association of America felt the need to pontificate on steroids and why/why not a certain player would/would not receive a vote. 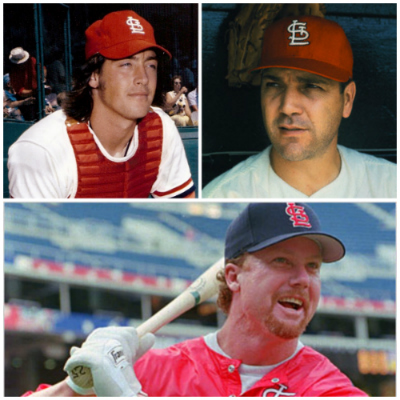 This year’s list of 50 includes several former Cardinals — Mark McGwire, of course, as well as Ken Boyer, Will Clark (his brief Cardinals career is even mentioned), Keith Hernandez, Jim Kaat, Ted Simmons, Joe Torre as a player and Larry Walker. The full list is interesting, with a top five of Tim Raines, first-timer Craig Biggio, Jeff Bagwell, Shoeless Joe Jackson and Alan Trammell. Overall, the post is tremendous and thought-provoking — much detail on each of the 50 who made the list, from a wide variety of writers, and I had the honor of writing about Ken Boyer. Thumbs-up to Graham for the huge effort in conducting the voting and compiling the final results into a terrific look at who should be in the Hall of Fame. You’ll find the complete list of 50 here. What do you think — what Cardinals should be in the Hall of Fame who aren’t? Sports writers who today stand tall and proudly point a stubby, stained finger in the direction of ballplayers suspected of boosting their numbers with artificial help, and bellow “Never, never, never the Hall of Fame for the likes of YOU!” should be forced to sit in front of those athletes and read from their stories and columns each penned from the early 1990s to the early 2000s. Writing and posting their indulgent, moralizing crap now does nothing to erase their fawning, slurping coverage of the steroid era. They may think their stand now is penance for their complicity, but it isn’t. They may think their “strong stand” now against the steroid era makes up for their omission then, but it doesn’t. What it does is convince at least this fan that perhaps the writers shouldn’t be responsible for deciding anything — no annual awards, no Hall of Fame vote, nothing. Let ’em post their Strassian stories of made-up intrigue, and we can hope a new generation of Gooldian reporters can stick to facts and informative analysis, helping to restore some small bit of credibility in the sports journalism field. Until then, the most prominent people who do not deserve to be a part of the Hall of Fame debate are those who currently hold ballots. Wow, for a deceased musical artist, Amy sure has a keen sense for sports journalism. I pretty much agree with all that she (or he) wrote. I will add to that a serious void of writers that saw some of the great players from the 50s and 60s will lead to many candidates begin forgotten. As you write in your article (and link to Mark’s article), Ken Boyer should already be in the Hall of Fame. He played in a more difficult stadium compared to Ron Santo and lost two prime years of his career to military service. What he did accomplish was helping his team win a World Series title. His defense in 1964 was very good and his grand slam in Game 4 turned the series around. The Yankees had it until that Al Downing changeup. Ted Simmons should already be in the Hall of Fame as well. I was glad to see Richie Allen and Reggie Smith getting some attention. Allen should be in and a strong case could be made either way for Smith. Curt Flood. Greatest defensive outfielder in my life. I’ve never seen an outfielder close on a line drive or fly ball like Flood. Before his injuries in 1967, he also had a cannon of an arm. He didn’t hit for power, but he hit consistently for average, patiently behind Lou Brock. Vada Pinson. This guy was unreal in his prime. A 5 tool player. The only thing he did wrong was play in the same outfield as one of the greatest players in history, Frank Robinson. Remember that the Reds had Robinson, Pinson and Flood in their outfield and chose to give up Flood. That should tell you all you need to know about Pinson. Lee Smith. Come on, the man was a machine. He was the first 9th inning closer and he spent the first 1/3 of his career with some very bad Chicago Cubs teams. 12 consecutive years of 60+ appearances, many of those with 40 or more saves. Before there was a Trevor Hoffman, there was the Big Man, and he needs to be in the Hall of Fame. Slightly off topic, Mike Shannon should be in the broadcasters wing of the Hall of Fame. Someone did mention Lee Smith on Twitter today. I don’t know much at all about Vada Pinson, but want to learn more now. Thanks, as always, for the education!